The Ask Leo! 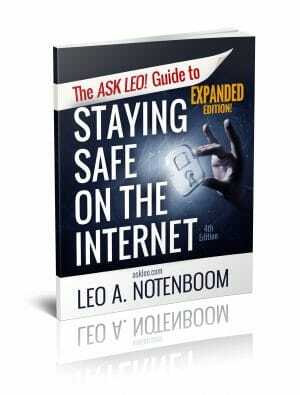 Guide To Staying Safe On The Internet - Expanded Edition - Ask Leo! Not a day goes by where we don’t hear about everything from hacked accounts and computers, to viruses, spyware and other forms of malware to large data breaches that threaten our online information. In this book I cover the the things you must do, the software you must run and the concepts you need to be aware of – to keep your computer and your data safe as you use the internet. It’s really not that hard, and once things are in place it’s not even that time consuming. The Ask Leo! Guide to Staying Safe on the Internet – Expanded Edition is now in its thoroughly revised and greatly Expanded 4th Edition. It covers not just your computer, but all the important aspects of your online life. Never lose precious files, emails or data again: Protect your data. Reduce the chances of malware ever impacting you dramatically, and recover quickly and easily if it ever does: Protect your computer. Travel worry-free with your laptop and its data protected, as well as securing your internet access wherever you may be: Protect your laptop. Prevent account hacks and how to recover quickly when they happen through no fault of your own: Protect your online world. Learn what we mean by common sense and never fall for scams and scammers again: Protect yourself. Yes, you can use the internet with confidence and peace of mind. A downloadable PDF version that you can read on any device capable of displaying PDF files. A downloadable MOBI version of the book, ideal for Kindle. A downloadable EPUB version of the book, ideal for a variety of other ebook readers. Prioritized support and contact to get your questions answered. Register your purchase, using a link that’s present in the book, and you’ll have access to the exclusive members-only area for The Ask Leo! Guide to Staying Safe on the Internet – Expanded Edition. Updated copies of the book instantly downloadable when released. Once you purchase you’re entitled to digital updates for life. As the book is updated, corrections made, or even new editions published, you’ll have immediate access to the digital downloads once you register. Also included with registration of your purchase is a FREE copy of Backing Up 101 – Six Different Ways to Back Up Your Computer (And Which Ones You Should Use) my valuable overview of different backup strategies, and which ones apply to your situation! You’ll also get The Ask Leo! Guide to Staying Safe On The Internet – FREE Edition. A subset of the Expanded Edition it’s yours to share with your friends. The sample contains the book’s table of contents as well as the first couple of chapters. If you like what you see, you can purchase the entire book below. Purchase the PDF directly from me. Purchase the Kindle edition from Amazon. Purchase the paperback edition from Amazon. Remember, no matter which you purchase you’ll get access to all digital formats. I believe in what I do, and I honestly believe that The Ask Leo! Guide to Staying Safe On The Internet can help you. If, after purchasing you’re not completely satisfied, just ask me for your money back.